Recycling equipment, designed and manufactured in the UK, proved to be a big hit at the international recycling and waste exhibition IFAT, held in Munich, Germany between the 14th and 18th May 2018. 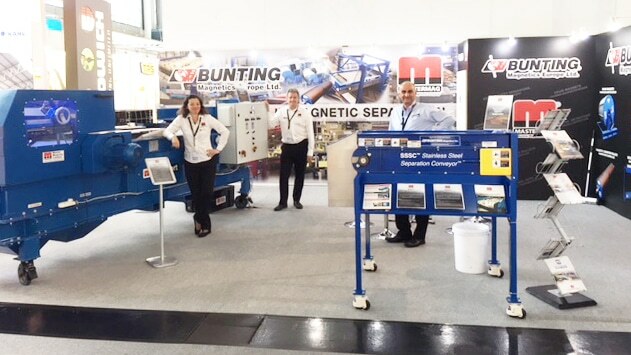 On the joint Master Magnets and Bunting Magnetics Europe stand was a working production-sized Eddy Current Separator and Stainless Steel Magnetic Separator. Activity on the stand was busy for the whole show. There was interest in a wide range of Metal Separation equipment including Permanent Overband Magnets (for positioning over conveyors to lift and separate ferrous metals such as steel beverage cans) and large Drum Magnets (used when separating larger heavier ferrous scrap). “Metal separation and recovery is vitally important for any recycling operation,” said Jonathan. “IFAT gave us the perfect platform to showcase and introduce our Magnetic Separators to companies involved in managing and processing waste across the world. Following the show we will be meeting with potential customers and also have several weeks booked to conduct controlled tests in our laboratory in Redditch.